Over the course of the last several weeks, I’ve been spending quite a bit of time working on a presentation I’m giving tomorrow for the Las Vegas Chamber of Commerce’s Business Education Series. Here’s a link to the session on the LV Chamber Website [Guess What? Traditional Sales Techniques are Killing Your Bottom Line]. 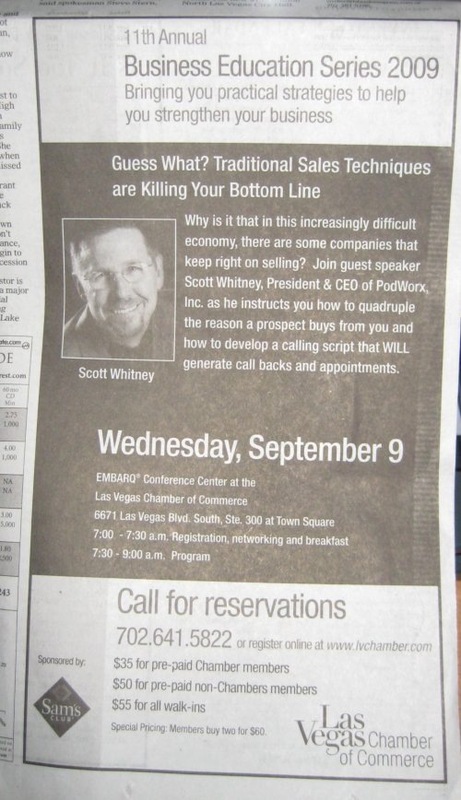 This past Sunday, I was reading the business section of the Las Vegas Review-Journal when I literally stumbled upon a quarter-page ad the Chamber ran for my session! I had no idea! A copy of the advertisement is below. Kudos to the LV Chamber for spreading the word. If you’re reading this and you’re in Las Vegas, I hope you’ll attend the session. It is going to be packed with a ton of great ideas to help drive more revenue for you and your company. 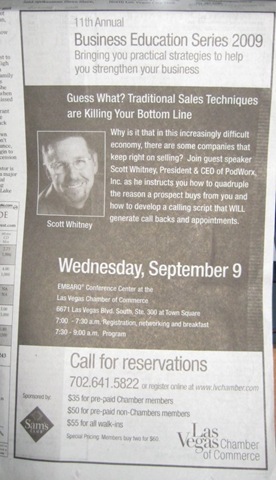 Last week I took a call from Las Vegas Business Press reporter Ben Tinsley. He was preparing a story on a company called NewsCactus.com and wanted my views on their latest product. I delivered said views and, as if by magic, a bit of what I said appeared in Ben’s article, which was posted online today. Because I spend a great deal of my business time pre-interviewing and interviewing podcast guests, I have a certain affinity for reporters. It takes a great deal of work to find the real nuggets of information that will help/education your reader (or podcast listener). Ben, as did John Przybys from the January 22nd Las Vegas Review-Journal article that featured PodWorx, did a great job of taking our conversations and making it work within the structure of their overall story. Something to remember when you’re producing your podcast episodes.